Wow, it's Friday again! 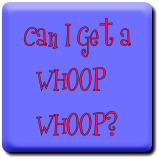 And not only Friday, but the beginning of a week at the beach for me - definitely whoop-worthy! I'm sure you've got things to whoop about too, so let's get right down to it! A few years ago, my friend contacted me about making a quilt for her first granddaughter, and we had a lot of fun creating a special quilt for Sadie. 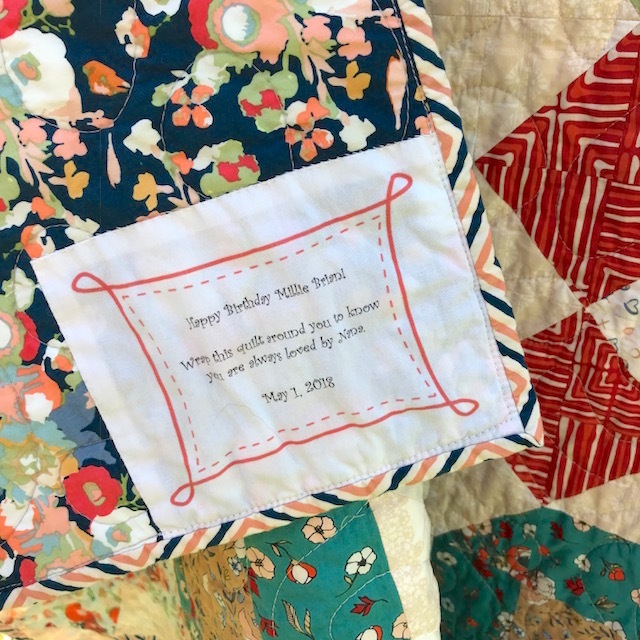 I was overjoyed when she contacted me recently to make a quilt for her second granddaughter! 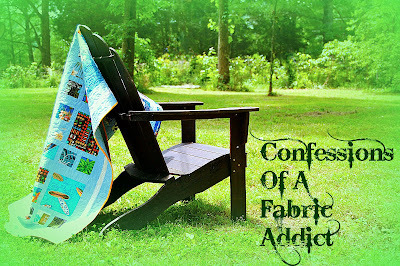 She picked out a great kit from Hawthorne Threads, using Maureen Cracknell's Love Story collection. The pattern is called X's and O's, and is available for free on the Art Gallery Fabric website - although there are mistakes in the pattern, so if you choose to download it, check with me for the corrections! 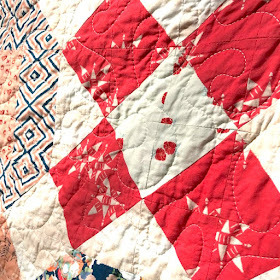 These fabrics are so sweet - sort of old fashioned, but with a modern twist. The colors are soft and saturated, and they make me smile! ...and finished it up with a label as requested by my friend - to commemorate this special gift to her granddaughter, Millie. 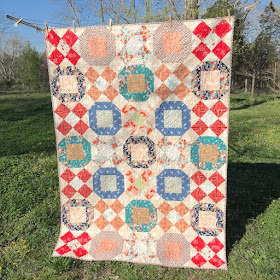 My friend has a grandson now, and another grandbaby on the way - looks like there will be a couple more "nana" quilts in my future!! And here's another HUGE thing worth whooping over - Take a look at the bottom of this post, right under my name. See that green button? You can now print out this post as a PDF file if you want! NOTE: If you don't see the green button, go up to the top of the post and click on the title - it will open the post as an individual item instead of one of a list of posts, and the button will be at the bottom of the post. Woohoo!!!!! Sorry somehow I posted it twic. Feel free to delete one. Very nice finish - and such a sweet label on the back! Great to have the PDF button - thank you Sarah! 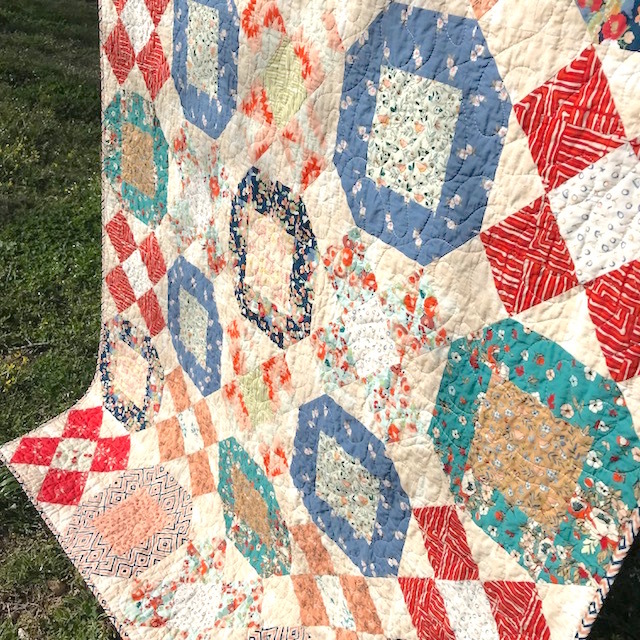 Such a sweet quilt. Have fun at the beach!!! 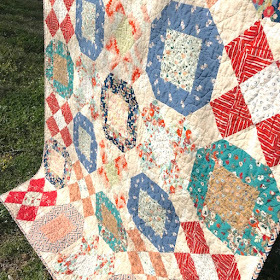 I'm happy dancing because I've finished my second quilt for this year for H2H and am ready to mail them. But I need an address for Little Lambs - email or mailing please! That quilt is beautiful! I love that it looks "old", but it's new. I hate when patterns are wrong - it's why I make test blocks and read patterns several time. I never cut out a complete project for this reason, also. BUT, it turned out beautifully and happy dance for you. How beautiful! Great job all sround. How about whoops whoops? I had a 'crop failure' of sorts in my first attempt to post a thumbnail above. Sorry about that. 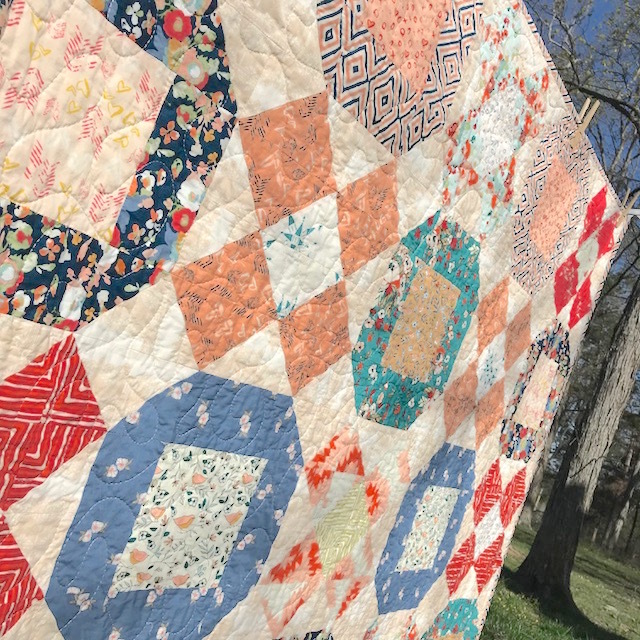 Thank you for the pretty spring quilt pics, and the linky party. The quilt is just beautiful Sarah! I hope you told AG about the mistakes... Have FUN at the beach! Great quilt. I hope you discovered the errors before you put in too much work. I like the pdf button. How did you do that? Love the X and O's quilt. Lucky Beach weather, we got snow again or still. 167 days and counting with below freezing at night, new record. Thank you for the pdf button! Wish everybody had one! Oh, so pretty! 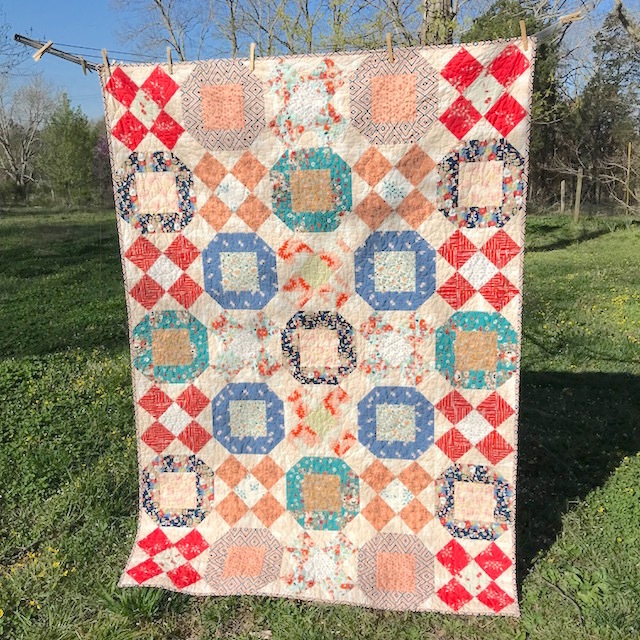 I love the old and new combination of this quilt!